Looking for a delicious gluten-free dessert? 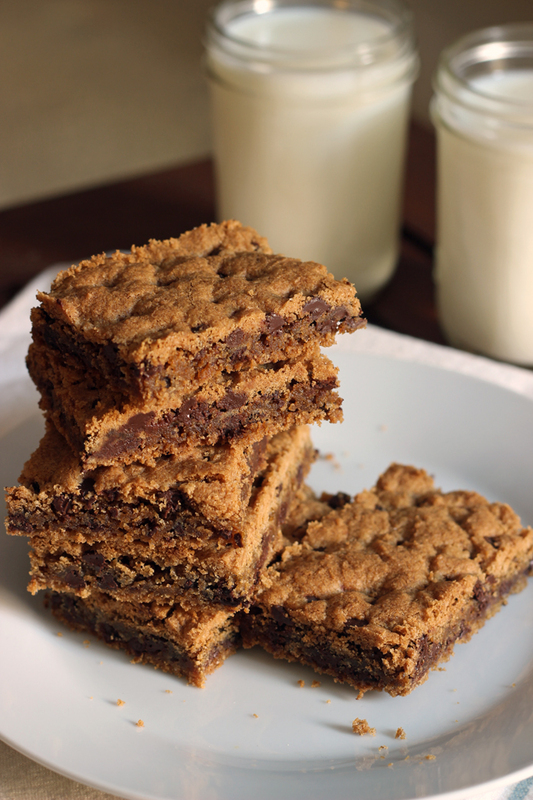 These Gluten-free Chocolate Chip Cookies Bars are perfect for lunch boxes, after school snacks, and evening dessert. My sister eats gluten-free, as does one of my best friends. I’d heard of their struggles to find baked goods that were, well, good, but I didn’t really understand until I started to test the gluten-free waters myself. Over the past month of checking out the gluten-free lifestyle*, I’ve done things that I never thought I would do, like buy frozen pizza and waffles. The pizza was not bad; it needed more sauce. The waffles, on the other hand, wow. Not sure what to say about that. Except that I can see how my friends eating gluten-free have struggled, if in a small way. That said, there have been some delightful discoveries, marked “gluten-free” at Trader Joe’s. Like this. And this. For lack of a better word, some of the products I’m encountering are just “fake food”. They’ve got lots of ingredients that aren’t even in my vocabulary, let alone in my pantry. Eating gluten-free naturally, that is, focusing on foods that are fine for everyone (like oats, rice, vegetables, meat, fish) is more my style. But, a girl wants to have a cookie every once in awhile. Am I right? I wanted to know that I could bake — and enjoy Christmas cookies in a few months — if I stuck it out with this gluten-free thing. Lynn said it was the best she’s had so far. A girl needs a cookie every once in awhile. Well, I can say, we’ve got a winner folks. 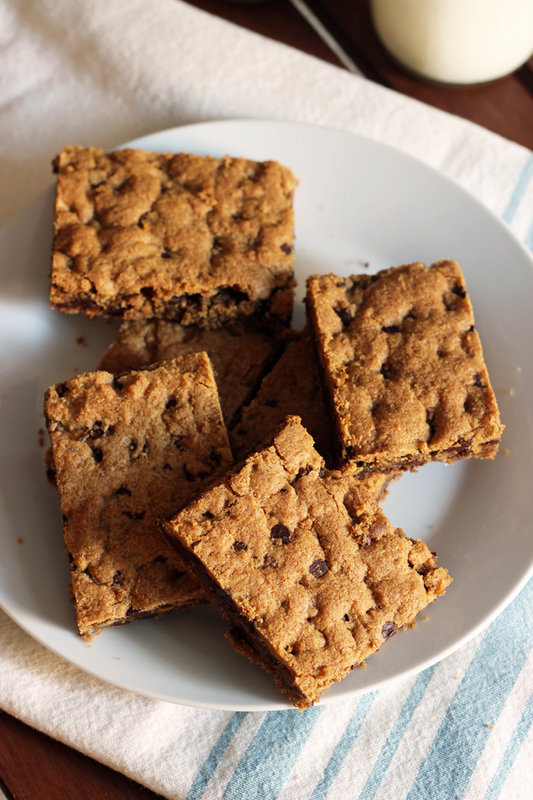 These bars, based on Jessika’s Amazing Chocolate Chip Cookies, were delicious. In fact, the whole family gobbled them down before my very eyes. Even FishPapa, who claims not to like sweets, enjoyed them. Lesson 1 of gluten-free eating: Hide the safe food from your family so that you can have a cookie when you want one. Yep, next time, we’ll work on the gluten version that the rest of the family can eat. Now, please note that these cookies are sweet. Gluten-free blends taste sweeter because they are higher on the glycemic index (if I’ve quoted Lynn correctly.) So be warned. These are dessert, not dinner. Preheat the oven to 350 degrees. Line a 9×13-inch baking dish with parchment paper. In a large mixing bowl, cream together the butter and sugar with an electric mixer. Scrape down the sides and add the egg and vanilla. Blend well. Add the baking blend, baking soda, salt, and chocolate chips. The batter will be sticky. Spread the batter into the prepared pan and bake for 20 minutes or until golden brown. Allow to cool in the pan for ten minutes before moving the parchment paper lined cookie to a cooling rack. Slice while warm for best effect. The bars will firm up as they cool. Store the cooled cookies in an airtight container at room temperature, for up to 3 days, or in the freezer for up to two months. Jessica, have you noticed any change in the symptoms you were having now that you’re have gone gluten free? If so, how have they changed? I’m just always curious about how diet affects what is going on in our body. Or is it it too soon to say? I would say that it would be too soon to say. I haven’t stuck to it 100%. Still weighing real life and what my doc said, which was that he’d love to read literature that supports that. Have you read Grain Brain by David Perlmutter? No, I have not heard of that one. Hi Jessica! I love this blend from Bob. I have a dear friend who is gluten free and I use it to bake for her. I was so happy to find this option! Good luck on your gluten free journey! I was thrilled to see this gluten free recipe! My husband was diagnosed with Cealic in December and it has been quite a journey trying to cook Gluten free. I try to just cook gf for the whole family since it is so much easier. I enjoy baking but struggle with finding good gf free dessert recipes that my husband enjoys. 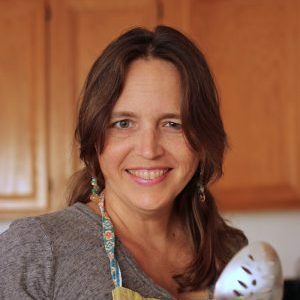 I would lbe super excited to see more gf free recipes on your blog! 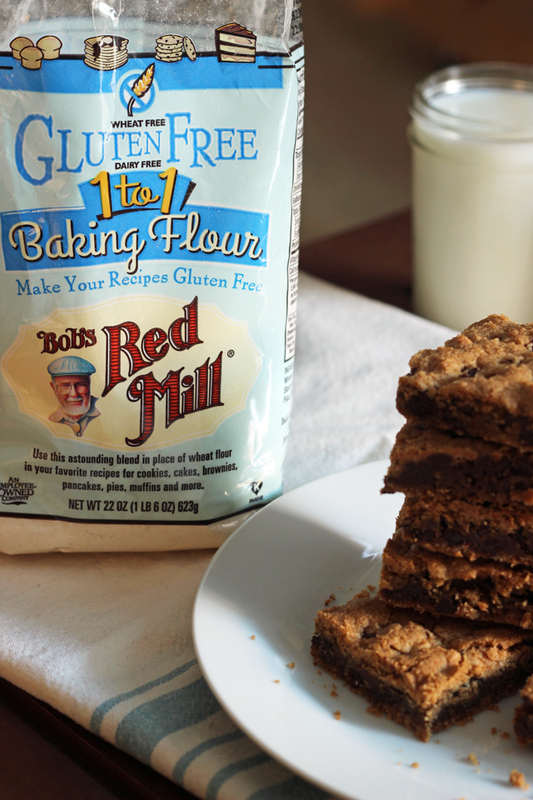 I’ve used the same GF baking flour from Bob’s to make the brownie bark recipe at artofglutenfreebaking.com. It’s really good! I haven’t tried Trader Joe’s brownie bark yet. I just saw that my Walmart started carrying this blend so I’m going to give it a try. I use King Arthur GF All Purpose for special occasions (outstanding – but insanely expensive!). Thank you! I’ve been gluten free for about 4 years now, and it is definitely a challenge (but worth it for me)! One resource that I love is Gluten Free on A Shoestring (glutenfreeonashoestring.com). Nicole is budget conscious (which is a challenge with gluten free for sure) and she has lots of amazing recipes for things look cookies 🙂 Best wishes as you work on this! I don’t do gluten free, but knew someone that did for awhile and know it isn’t easy and has lots of pitfalls if the whole family and kitchen isn’t GF. 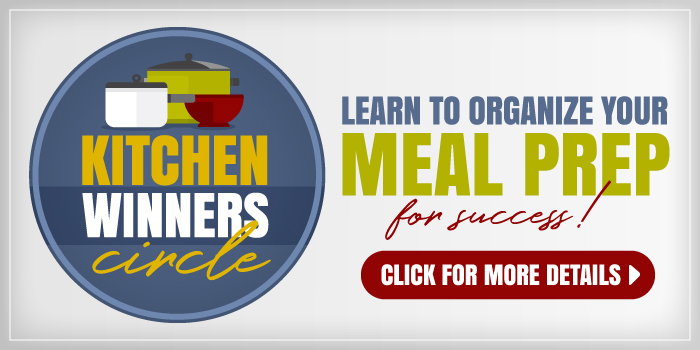 I do know that there are a lot of GF recipes on the mennonitegirlscancook.ca blog. One of the group that do the blog is GF and has posted quite a few recipes with info. There is a separate tab under the recipe index for gluten free. Those of you who are following GF might find it helpful. Good Luck. 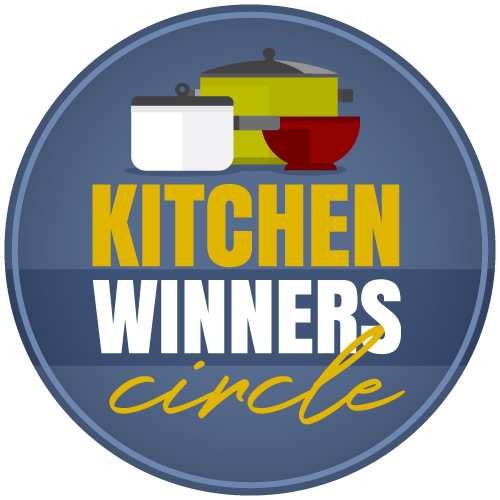 Thank you so much for the blog link-they have so many great GF recipes that I can’t wait to try! We’ve been gluten free for two years now, so I know what a struggle the transition can be. I hope you see an improvement in your health! Thanks so much for a delicious recipe! This is just perfect for the holidays. We shared your post on 1099 Mom. I had to giggle at this. Two of us are gluten-eaters here and two are GF, and hubby is pretty new to this. Because it is ME that makes the treats usually, I have decided that we will all eat the GF treats so that I don’t have to make a batch of each and then have confusion over which is safe and which isnt. I made some brownies recently, and my son was reaching for one, when the hubby said “Don’t eat that. It’s ours. You can eat anything you want.” He never used to care before. I can’t wait to try these. I think I have everything I need. It’s good to see that someone is posting gluten free recipes but I was surprised ro see that these chocolate bars are loaded with sugar. Sugar is 2x as bad as gluten for most people, expecaially for the bacteria in the digestive system. Hope to see more recipes with less sugar. My personal feeling about baked goods (gluten-free or not) is that they should be a treat, not a steady diet. Sugar is bad for everyone, so it should be consumed as an occasional treat. More gf recipes for cheap eating. I used this recipe twice and it has come out well both times. The only thing is that the batter is so thick that it is easier to use for making cookies than bars which is a bit disappointing because scooping out cookies is what I was trying to avoid. I do cut the sugar in 1/2, but everything else stays the same. I wonder if the batter is thick for everyone or if changing the sugar is what is making the difference for other people? I wonder if I could add more liquid- any suggestions?